RENT - THE HIT MUSICAL! 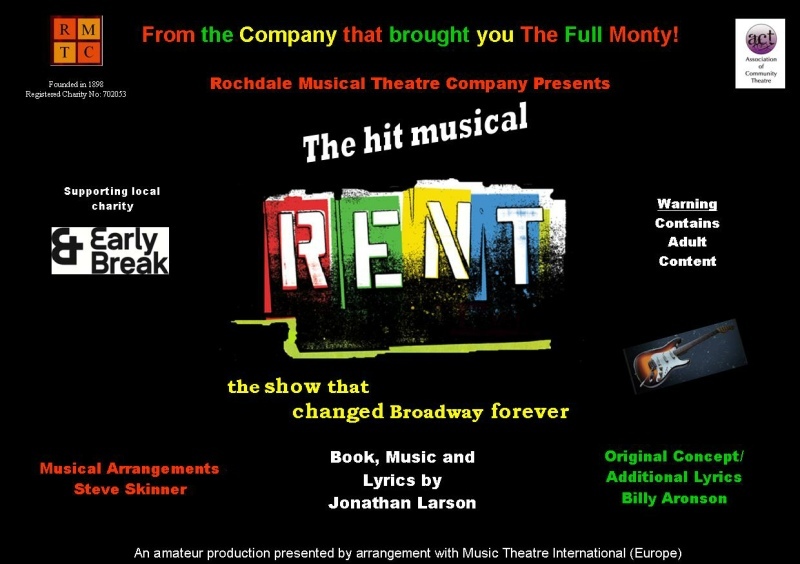 Rochdale Musical Theatre Company proudly present RENT - THE HIT MUSICAL! Set in 1989 in the East Village of New York City, a group of New Yorkers struggle with their careers, love lives and the effects of the AIDS epidemic on their community. Mark, an aspiring filmmaker, and Roger, an HIV-positive musician, scramble for money to pay rent to their landlord and former roommate, Benny. Meanwhile, their friend Tom, a professor, has fallen for Angel, who is slowly dying of AIDS. Winner of the Tony Award for Best Musical and the Pulitzer Prize for Drama, this landmark musical has become a pop cultural phenomenon. Uplifting and inspiring with songs that rock (including the beautiful Seasons of Love) RENT promises an unforgettable night out! ADULT CONTENT. NOT SUITABLE FOR UNDER 16s. Follow the BOOK ONLINE link or ring the Box Office on 0300 303 8633 to book. Family tickets consist of 2 adults and 2 children tickets only. Select the child seats from the drop-down lists, after you have selected your seats, and the system will automatically apply the family ticket discount. A transaction fee of 5% will be charged on all tickets purchased over the phone or via online transactions. We will either apply a family ticket discount or a group discount but not both.